The Panasonic Lumix DMC-LX7 is a premium compact digital camera with a fast lens, full range of manual shooting modes and RAW file support. The new LX7 aims to build on the success of its LX5 predecessor with a new 3.8x, 24-90mm f/1.4-2.3 zoom lens, large 1/1.7-inch 10 megapixel MOS sensor, an ISO range of 80-12,800 and 1920x1080 50p Full HD movie recording with a Creative Movie Mode for adjusting both the shutter speed and aperture. The LX7’s aperture ring and rear dial provide full control over the aperture range, while an internal neutral density filter allows slow shutter speeds to be used in combination with fast aperture settings. The Panasonic Lumix DMC-LX7 is available now in black or white for £449.99 / $499.95. 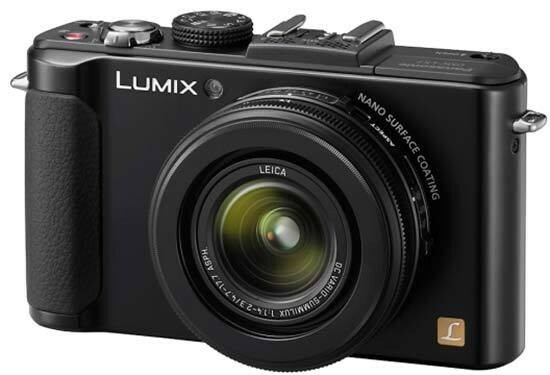 Successor to the LX5, the metal construction 10.1 megapixel Panasonic Lumix DMC-LX7 arrives with various outer and inner tweaks at a rather steep manufacturer's suggested price just shy of £450 in the UK. Aimed at both high end amateur photo enthusiasts plus existing snapshot owners looking for a step up, but presumably not wanting the comparative bulk of a Micro Four Thirds hybrid model nor DSLR for a similar price, the LX7 provides both full iAuto and manual shooting options. It however gives a nod to Panasonic's G-series hybrids, in particular the GF-series, by including an accessory port for an optional Live View finder just below its vacant flash hotshoe. So, in the absence of a built-in optical or electronic viewfinder, the LCD is naturally used for shot composition and review. The screen itself is a bright 3-inch model with 920k dot resolution that provides a naturalistic translation of the scene before the lens. However you will still find yourself squinting and cupping a hand around it in bright sunlight, so the optional DMW-LVF2 viewfinder is a wise investment. As expected at this price-point, both Raw and JPEG files can be committed to SD/SDHC/SDXC or Eye-Fi cards, and conveniently both can be shot in tandem, with write speeds impressive at just two to three seconds. It further boasts an improved 3.8x wide optical zoom, offering a focal range equivalent to 24-90mm in 35mm terms, optically stabilized to help prevent image blur from camera shake and with a Nano Surface Coating to help prevent lens flare. Best of all is the faster f/1.4 maximum aperture, which makes it easier to achieve DSLR-like shallow depth of field and out-of-focus backgrounds, whilst also proving invaluable when hand-holding the camera in low-light. Rest the Panasonic Lumix DMC-LX7 in your palm, a manageable 298g even with battery and card inserted, and you'll be tempted to make exploratory prods, twists and presses almost immediately. The sliding switch that releases the pop-up flash with a satisfying 'clunk' being particularly enticing, as is, just as obviously, the slider switch sitting atop the lens barrel for adjusting picture ratios. The LX7 is, for those looking to tentatively get more hands on with their images, a veritable box of goodies. There's the option of selecting the standard 4:3 digital ratio dead centre of the 'dial', with 3:2, 16:9 and, more unusually, 1:1, being the alternatives. Slide your left hand down and to the left of the lens surround and there's a further tactile switch for swapping between auto focus, macro focus and manual focus. For the first time on the LX-series, an intuitive aperture ring additionally surrounds the lens, much like the one seen on the Fujifilm X100 camera. This allows you to quickly change the aperture, with 16 1/3rd exposure steps available running from f/1.4 through to f/8. If you zoom to a focal length that slows down the aperture range, these physical markings obviously don't change - so at 90mm, for example, choosing f/1.4 actually sets the aperture to the fastest available value of f/2.5. Furthermore, changing the ring from f/1.4 to f/2.2 has absolutely no effect on the camera's settings, as those apertures aren't available at 90mm. Other than this unavoidable quirk, the new aperture ring is a great addition that further adds to the photographer-friendly feel of the LX7. The Panasonic Lumix DMC-LX7's grip may not be large but its leather-effect rubber padding further prevents the camera from feeling like it will slip from your grasp in a strong wind. Overall it comes across as a compact and elegant solution, with body proportions measuring a manageable 110.5 x 67.1 x 45.6 mm. This therefore is a camera that will slip readily into a pair of jeans, not just a jacket or small bag. So, as we did, you'll find yourself taking it out more often. 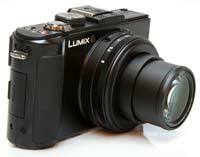 The 'tweaks' referred to at the outset govern the LX7's MOS sensor, which has been re-designed over the LX5, claims Panasonic, as has its image processor. Here the latter is the grandly named Venus Engine VII FHD. In tandem they are claimed to offer boosted dynamic range and improved low light performance (from ISO80 to an incredible ISO12800 manually selectable), which we'll come to in the image quality section of our write-up. The MOS sensor also greatly increases the camera's burst shooting options, with a fastest setting of 11 frames/sec for 12 full-resolution images (focus and exposure fixed at the first frame). Slower modes of 5 frames/sec and 2 frames/sec complete with AF Tracking are also available, with the High-speed Burst mode capturing 60 frames/sec at 2.5 megapixels or 40 frames/sec at 5 megapixels. Under the bonnet adjustments apart, with the Panasonic Lumix DMC-LX7 we have other Lumix family regulars making a re-appearance. Selected via a twist of the ridged top plate mode dial there's the subject recognising and performance optimising intelligent Auto (iA) mode for point and shoot simplicity, plus an extensive range of Creative Control in-camera effects. Users also get access to six customisable Photo Style modes via the on-screen menu when the shooting dial is turned to a creative mode, such as program, aperture priority, shutter priority or manual. There's a choice of auto and intelligent auto ISO settings, with a range that extends from ISO 80 up to ISO 6400 at full resolution. Choose the further ISO ISO 12800 equivalent option and JPEG-only resolution drops to a compensatory three megapixels - an on-screen prompt warning you of the fact that settings have changed should this be selected. In any event, this is a nod to the sort of spec to be found on a semi-pro DSLR, so to be welcomed at a compact level. It's undoubtedly these familiar elements that will appeal to anyone trading up from say a FS-series Lumix compact, and soften any perceived learning curve from what otherwise outwardly appears a more sophisticated proposition. A flick of the top-mounted on/off switch and the LX7 powers up in two seconds. The LCD fades into life and the lens extends from within its protective housing to maximum 24mm-equivalent wideangle setting. Generally the camera is as fast and responsive as one could wish for. It's from the front and top that the Panasonic Lumix DMC-LX7 most shows its enthusiast targeting mettle, large (for a compact) 24mm wide angle Leica-branded lens staring you in the face as you tease the camera from its packaging. 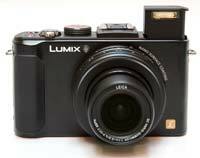 Unlike cheaper Panasonic compacts there's no automatic sliding lens cover to protect the glass when not in use, just a separate lens cap of the clip on variety that may quickly get lost in a pocket. Thus we found ourselves inadvertently getting fingerprints on the glass when placing the LX7 into or retrieving it from a pocket. With the aspect ratio adjustment and focus mode sliders and new aperture ring encircling the lens surround as previously mentioned, above the lens and to its left is an AF assist/self timer lamp. On top we get that vacant hotshoe protected out of the box by a piece of plastic that also envelops the accessory port nestling just left of centre of the LCD, in front of which are the new stereo microphones. The rest of the top plate features are also what prompts the LX7 to appear from this angle at least to be a GF- 'lite'. Nestling next to the hotshoe we have a narrow profile and firm shooting mode dial with 10 options squeezed around it. As well as iAuto we get the P,A,S,M quartet plus, not just a movie mode, but a 'creative movie mode'. Then there is a separate setting for the Creative Control modes, another for the 16 scene modes (the usual family-friendly array of portrait, landscape, baby and pet settings), and not one but two user customisable settings. The creative movie mode is where technologies converge and the Panasonic Lumix DMC-LX7 becomes an intriguing prospect for would-be videographers, providing access as it does to the same creative exposure P,A,S,M modes selectable when shooting stills. You also get access to all the Photo Style and Creative Control modes when shooting video. ISO settings, white balance and AF tracking are also all accessible when shooting movies. So this is a digital stills camera where video seems more than just an afterthought, or an exercise in box ticking. The normal bugbear of exterior location shoots is also dealt with thanks to a wind cut option among the four screen's worth of menu settings in motion picture mode. Happily, the full extent of the smooth and steady optical zoom can be accessed when shooting video, its mechanical operation quiet and minimally intrusive. New to the LX7 is high-speed video recording at 120fps (NTSC) / 100fps (PAL) in 720p MP4 format, providing a creative slow-motion effect. Back to stills for a moment though and, if results straight out of the camera are too naturalistic for the photographer's liking, the expanded and renamed Creative Control modes also give vent to the interior auteur. It's here one can choose the vibrant, saturation boosting 'Expressive' setting from an expansive range of options also including film grain, pin hole, silhouette, dynamic black and white, dynamic art, high dynamic, monochrome, elegant, pure, or retro colour effects, with the welcome ability to alter the look of each individual effect should you so desire. The Panasonic Lumix DMC-LX7's new Time Lapse Shot mode automatically starts recording a time lapse sequence once the start time, interval and the number of pictures to shoot are set, although there is a slightly disappointing maximum limit of 60 shots and a minimum limit of 1 minute, which rather curbs the creative potential of this mode. Next to the shooting mode dial is the raised shutter release button ergonomically encircled by a rocker switch for operating the zoom. As indicated the zoom glides fairly leisurely through its range, taking just over three seconds to get from maximum wideangle to extreme telephoto. Tabbing back and forth it's possible to be reasonably accurate with your framing. Just right of this we have the recessed 'one touch' video record button that very usefully allows the user to be up and shooting video in a thrice no matter what other (non video) mode they might have selected on the adjacent dial. Just behind this we find the aforementioned on/off switch. 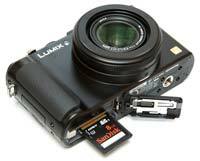 If the front and top resemble one of Panasonic's hybrid Four Thirds models, the LX7's backplate is an altogether humbler, or as we've indicated more approachable affair. It's here we have echoes of one of its £199 point and shoots; apart, that is, from the enthusiast enticing giveaways of an AF/AE lock button and DSLR-like command/jog dial top right, which makes it easy to change the shutter speed and in conjunction with the aperture ring set the Manual exposure mode. The Panasonic Lumix DMC-LX7 has an internal Neutral Density filter, now easily accessible via the new ND/Focus button on the back of the camera. The ND filter proves almost essential given the LX7's maximum f/1.4 aperture. In bright sunlight conditions when shooting wide-open to get the minimum depth of field, the fastest shutter speed of 1/4000th second can easily be exceeded - simply press the ND button to slow down the shutter speed by 3 stops and avoid exposure problems. Alternatively this button, in tandem with the command dial, can be used to adjust the expansiveness of the AF area, or alter its default position of dead centre of the frame to off-centre instead, with a subsequent press of the navigation pad cross keys. The top key of the quartet is marked ISO, which provides quick access to the extensive ISO range of 80-12800. To the right, at three o'clock, the next key is given over as a shortcut to accessing White Balance settings on the fly. The bottom key is for the LX7's self-timer options: here either the standard two or ten seconds. At nine o'clock we get a customisable 'Func' (function) button as another short cut, by default providing instant access to the AF Area settings. Beneath this again we get the final two buttons on the camera back, for self explanatory Display - a press of which turns of the operational icons or brings up a nine-zone compositional grid - and, the Q.Menu or 'Quick Menu' button bringing up the toolbar of key shooting settings. Again, choose one of the creative shooting modes and the user has access to photo style settings, flash options, metering mode, AF area, white balance, picture size and even a six option video recording quality. 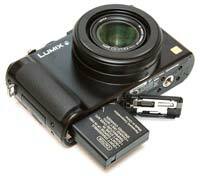 While that's it for the Panasonic Lumix DMC-LX7's backplate, the right hand side of the camera - when viewed from the back - features a terminal door covering both HDMI (cable optional) and AV/USB out ports. There are also vacant lugs on the left and right hand flanks of the camera for attaching the provided shoulder strap. The base of the camera meanwhile features an off-centre screw thread for attaching a tripod, the other under-side feature being the compartment housing the battery, good for 300 shots from a single charge, and SD/SDHC/SDXC or Eye-Fi media cards.